Fine. 0099479311 ALL BOOKS SHIPPED WITHIN 1 DAY OF PURCHASE! 1. Read it all at once. 2. Don't try too hard to understand it. It all comes together at the end. 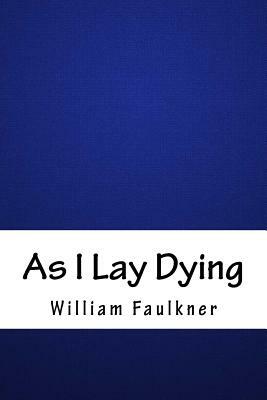 William Faulkner's As I Lay Dying is a kind of comic allegory of family, duty, honor, and pride. Scene upon scene are plainly grotesque: Addie, the Bundren ancestor, looks out of the window to see her son Cash building a coffin, her body placed in reverse to accommodate her bridal gown, the smell emanating from the box, the journey to her hometown Jefferson, the episode on the river, Cash laid on a palette atop the coffin after breaking his leg. This is an essentially comic treatment of death--and a harbinger of black comedy--but Faulkner complicates a relatively simple plot by maddening the reader with 15 different points of view. Perhaps it's as Cleanth Brooks wrote: the novel's multivocal nature highlights the human isolation within the Bundren family. Less important than The Sound and the Fury and Absalom, Absalom! in the Faulkner canon, but darkly funny if the reader can bear the relentlessly shifting perspectives. The story shifts point of view in this epic tale of a disfuctional family. The story is told out of order due to switching perspectives. A family comes to terms with thier mother's death. The fueding brothers Darl and Jewel take up most of this sad tale.